Amanda is the Marketing Manager of Delaware Theatre Company in Wilmington. 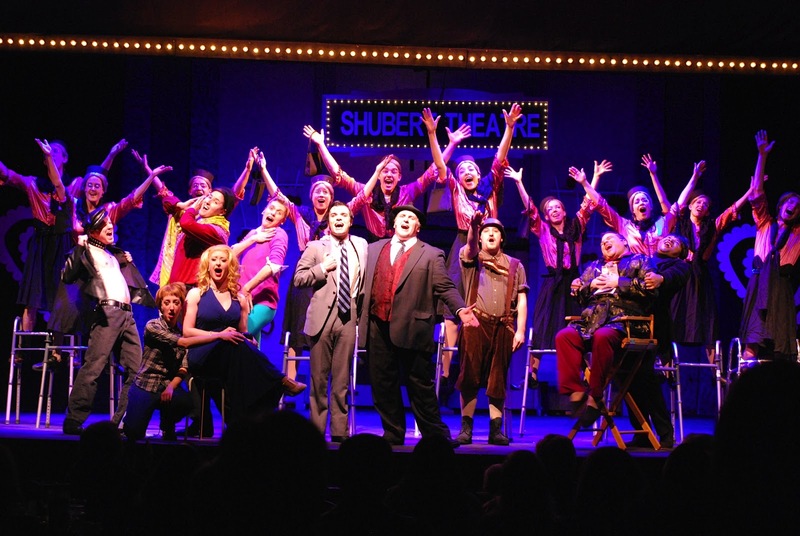 There’s no disputing it: Mel Brooks is a satirical genius, and New Candlelight’s current production of The Producers, running now through March 17, does him proud. That is to say, deliciously offends with ribaldry, wit, and ridiculousness — the perfect combo for an evening at the theatre (Not to mention, dinner is served… By the actors, nonetheless). For those not familiar with the play, (“Because you’ve been living under a rock,” is really the only acceptable explanation here) The Producers, set in 1959, centers on the unlikely pair of larger-than-life, washed-up Broadway producer, Max Bialystock and his sweet, naïve, and neurotic new accountant, Leo Bloom. Driven by his desire to become a Broadway producer and cajoled by the dominating Bialystock, Bloom and his partner develop a scheme to find and produce the worst play ever, in an effort to financially benefit from the flop. In comes a hilarious cast of characters to produce Springtime for Hitler, written by escaped Nazi Franz Liebkind, directed by flamboyantly fabulous Roger DeBris and starring Bialystock and Bloom’s new office assistant and Swedish stunner, Ulla (fifteen-syllable-last-name). Needless to say, hilarity ensues. The true stand-outs of the evening were Anthony Connell as the neurotically endearing Leo Bloom, with a Broadway quality voice and brilliant comic timing, complemented well by the Nathan Lane-esque performance of David Wills as Max Bialystock. The two have hilarious chemistry and are a joy to watch on stage. Jeffrey Lanigan as Franz Leibkind, the Nazi playwright, brought perhaps the biggest laughs of the evening with his rendition of “Der Guten Tag Hap Clop.” Backed up by his beloved pigeons (puppets that come to life in pivotal moments, most notably to offer a winged ‘hiel’ at the end of “In Old Bavaria,”) Lanigan’s rich operatic voice and comedic chops made him an audience favorite. Typically poised to steal the show is the character of Carmen Ghia, Roger Debris’ flamingly gay ‘Common-Law Assistant’, played by a somewhat restrained and difficult to hear Timothy Lamont Cannon. The notable moments in which Carmen delivers an impossibly long final “Sssssssss” (playing off stereotypes, as Brooks’ does at every turn), was not as outlandish in this version. Thankfully Roger DeBris’ design team gathered back the scenes’ momentum with their ridiculous entrances including, of course, sock-wielding Brian the choreographer, who garnered non-stop laughs. The character of Ulla (Lindsay Mauck), while played with charming enthusiasm, seemed to read as more of a caricature even in scenes that required a softness and romanticism between her character and Leo. That said, the bawdy nature of her character brings a great deal of consistent laughs. 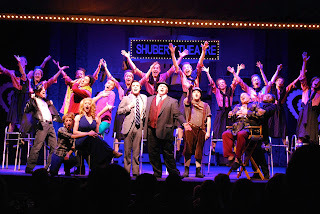 Bottom line — If you’re looking for a brilliantly written satire with some amazing talent; fun, splashy costumes; and the kind of outrageous humor that only Mel Brooks can deliver, The Producers at New Candlelight is your best bet. Be forewarned, however, that you may leave the theatre singing “Springtime for Hitler” for days. Just be prepared to explain this to co-workers!